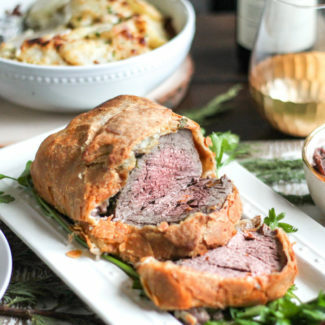 This Beef Tenderloin with a Red Wine Mushroom Sauce is an easy and delicious meal to serve at a dinner party. The Christmas Season is in full swing and it is time to start thinking about what to serve for Christmas Dinner. 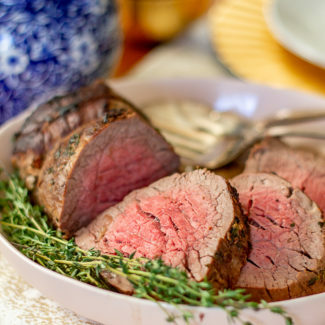 My family tends to serve something different each year, and in recent years we have been making beef tenderloin. 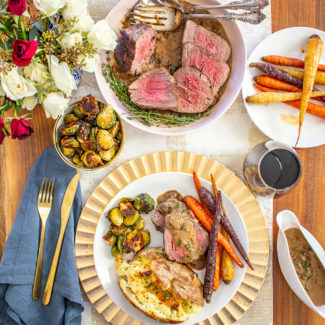 It’s a meal that is formal enough for the occasion, without being difficult to prepare. 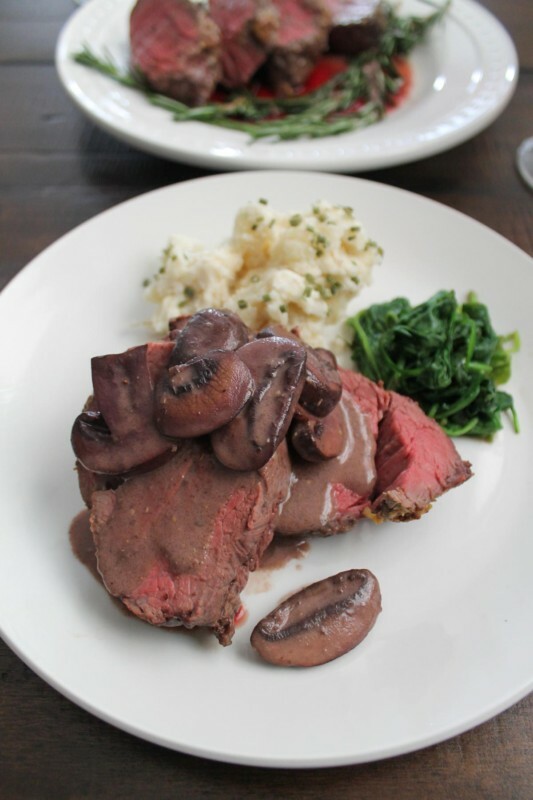 This recipe for Beef Tenderloin with a Red Wine Mushroom Sauce is one of my favorites. The active preparation time is just less than 30 minutes, and the total preparation time is under 2 hours. Plus it is one of those recipes that can easily be adjusted to feed more people just by purchasing a larger piece of meat. 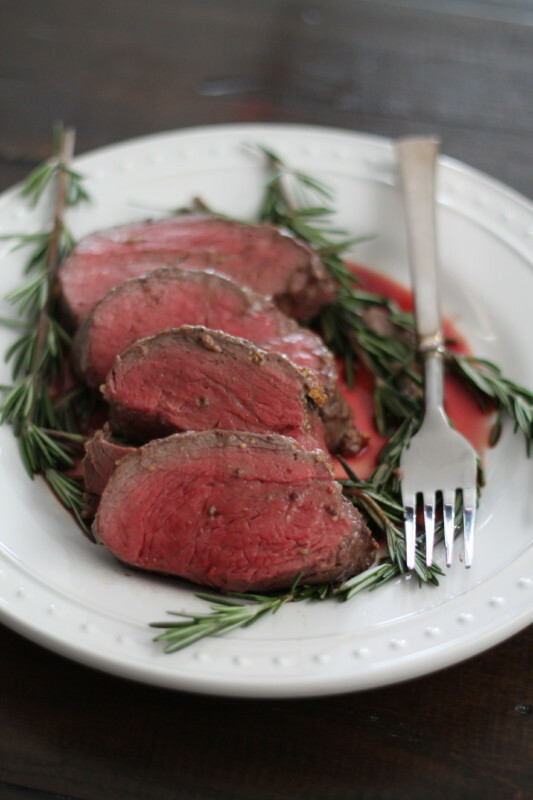 Beef tenderloin is easy to prepare and this reverse sear method will ensure the beef is medium rare throughout. The mushroom red wine sauce makes this dish extra special, although you could simplify the meal by leaving it out. 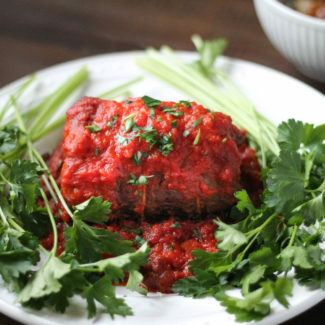 The only trick to this recipe is making sure that you do not over cook the beef. Using an in-oven thermometer will be a huge help since it tracks the temperature of the meat as it cooks. 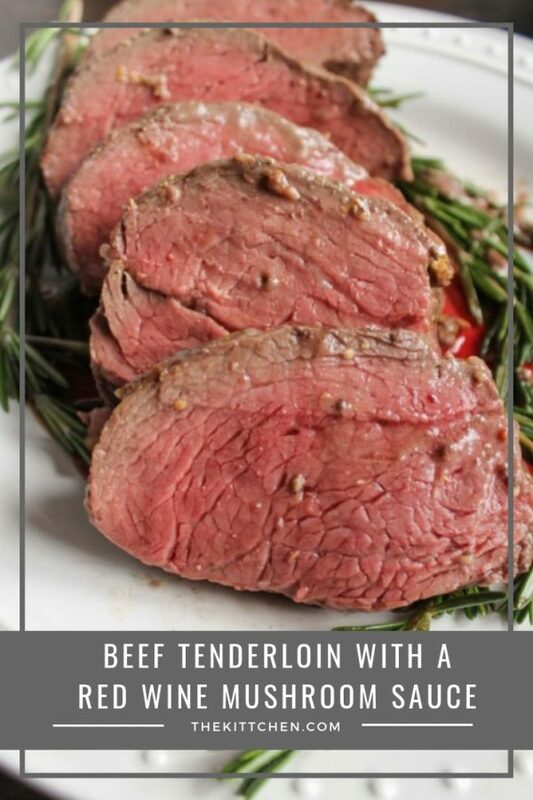 If you want medium-rare beef tenderloin, cook it until the center reaches 125 degrees, and then turn the broiler on for 3-4 minutes. 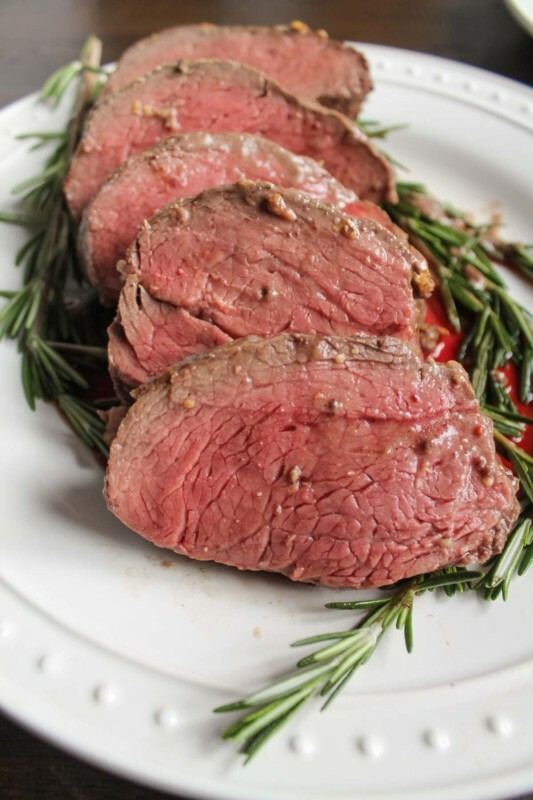 Searing the beef under the broiler will bring its temperature up to 135 degrees while creating a crust on the outside. If medium rare isn’t your thing, remember: rare is 125 degrees, medium is 145 degrees, medium well is 150 degrees, and well done is 160 degrees. 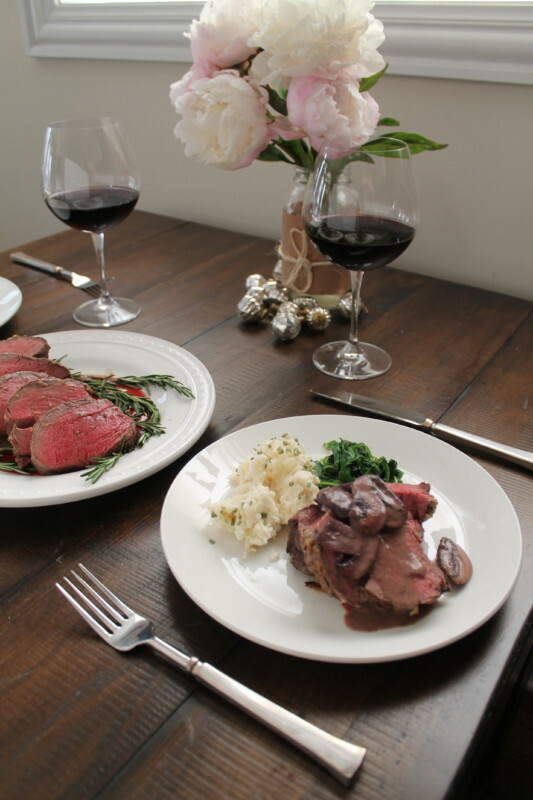 I suggest serving this Beef Tenderloin with a Red Wine Mushroom Sauce with mashed potatoes and a vegetable. 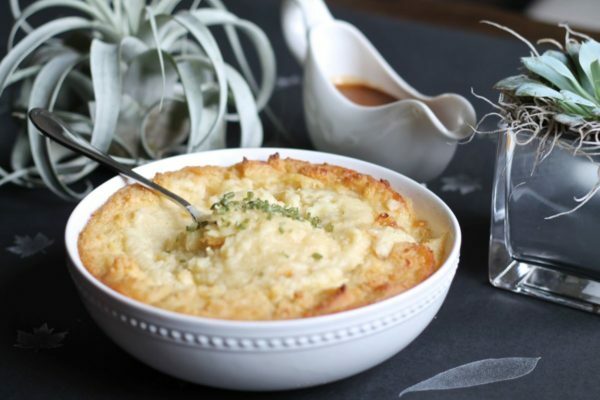 This recipe for brown butter and parmesan mashed potatoes is exceptionally good. 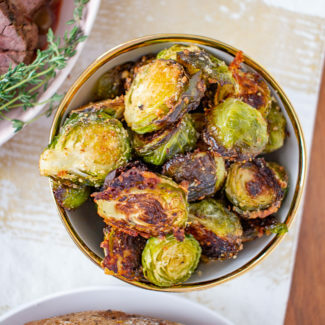 Brussels sprouts or Creamy Spinach would be a nice way to round out the meal. Heat oven to 250 degrees. Either finely chop the garlic or crush it with a garlic press. 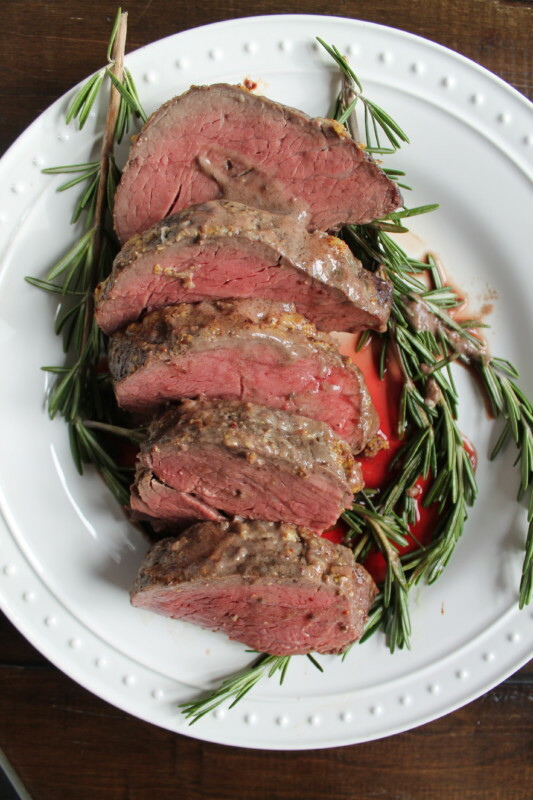 Place the beef in the center of a roasting pan on top of the sprigs of rosemary. Spread the butter, garlic, and mustard evenly over the beef. Sprinkle the salt and pepper over. Place the beef on a center rack in the oven to roast. For medium rare beef, you want to roast the beef until it reaches 125 degrees before you sear it. 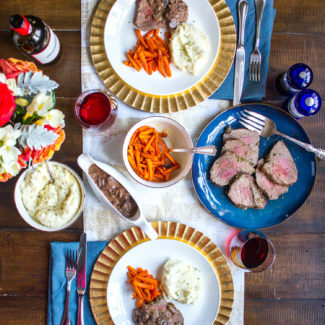 The cooking time will depend on the size of the beef tenderloin, but it took about 1 hour and 20 minutes for a 2-pound beef tenderloin to reach 125 degrees. The key is to keep your eye on the temperature of the meat; this is the time to use an in-oven digital thermometer if you have one. While the beef is cooking, sauté the mushrooms for the red wine sauce. Heat 1 tablespoon of butter in a skillet over medium heat low. Once the butter has melted, added the mushrooms and dust with a bit of salt and pepper. Stir to evenly distribute the butter, and add the red wine. Sauté the mushrooms until half of the liquid has been absorbed. Then set aside for later. Once the beef reaches 125 degrees, increase the temperature of the oven to broil (or high broil if you oven has multiple broil settings). Broil the beef for 2-4 minutes, keeping a close eye on the beef. You want a slight crust to form on the beef. Place the beef on a platter and let it rest while you prepare the sauce. It is important to let the beef rest before slicing it. This way the beef will lose less juice, resulting in more flavorful meat. To prepare the red wine sauce, scrape up any brown bits from the pan you used to roast the beef and pour them and any juice into a small saucepan. You can discard the rosemary. 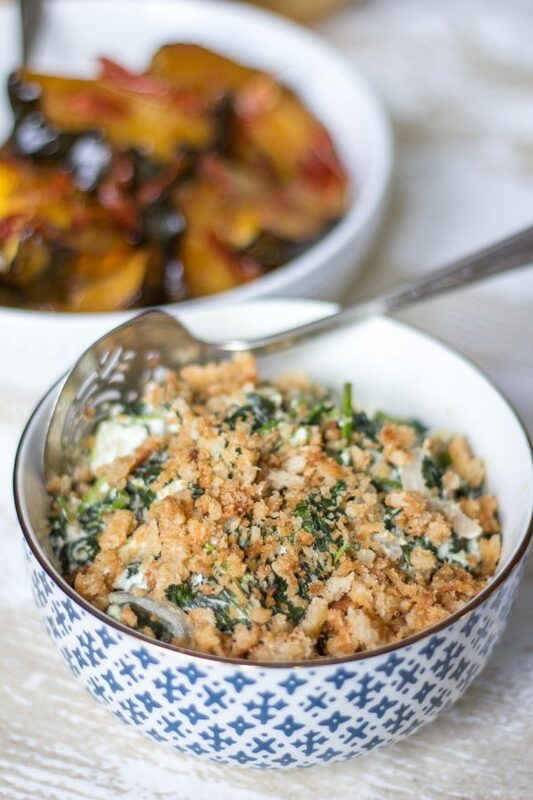 Heat the saucepan over medium heat, and add a tablespoon of butter and whisk in 1 teaspoon of flour. Once combined, pour in ¼ cup stock, 2 tablespoons cream, and ¼ teaspoon mustard. Mix and let slowly bubble for 1 minute, and then add the sautéed mushrooms and the liquid with them. Stir together until warm. Note: If the sauce is too thin, mix 1 teaspoon of melted butter with 1 teaspoon flour and add it to the sauce, let bubble and thicken for 1 minute (if the sauce is too thick add extra stock). Slice the beef into pieces 1 inch thick and serve with the red wine mushroom sauce. 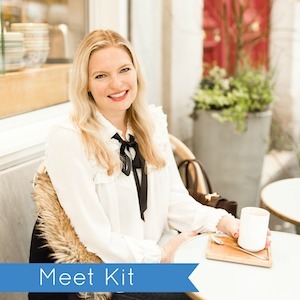 I originally developed this recipe for The Everygirl.